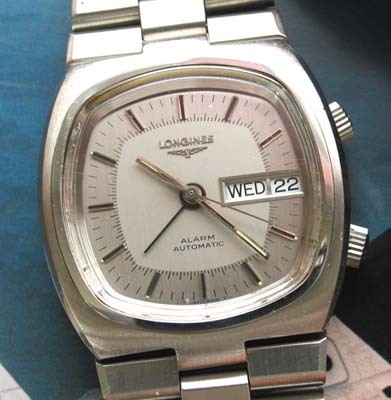 A great example of a 1970's Swiss Longines mechanical alarm watch. A fine example of a late 1960’s to early 1970’s automatic mechanical Alarm Wristwatch. The watch has a very solid and thick, square shaped stainless steel case, with an integrated solid steel link bracelet fitted. 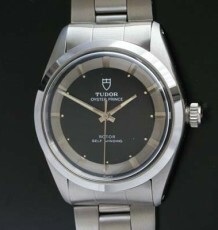 The original 2 tone dial is in mint condition and features a day and date display. 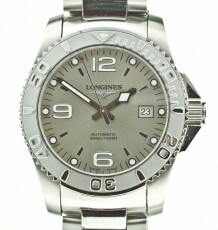 The Longines Automatic movement keeps excellent time in all postions. The movement uses a 2 crown configuration and the top winding crown sets and winds the time keeping functions. The bottom crown sets and winds the alarm feature. The mechanical buzzing made by the watch is a pleasant change from the battery operated models currently manufactured. Both crowns are fully signed Longines and are original to the watch. 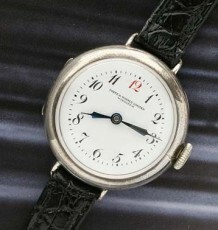 The watch measures 38mm wide by 41mm long. 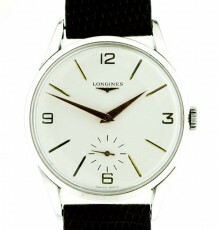 The Longines bracelet that is fitted to the watch will accomodate up to an 8 1/4 inch wrist!